It's that time again, when I analyse my year's reading -- it's interesting to me, even if it's not that fascinating to anyone else! 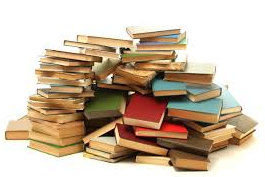 I read a total of 87 books this year, well up on last year's total. I think this may have been because I made a conscious decision to read books I wanted to read, rather than books I felt as if I should read. As usual, the ladies dominated. 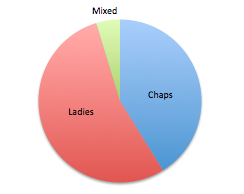 But the chaps came much closer to parity! 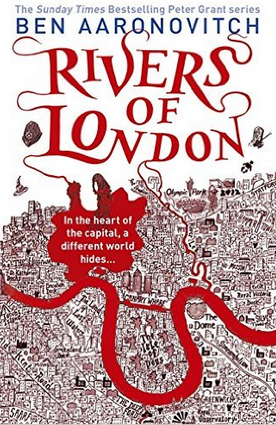 This might be partly due to my discovery of Ben Aaronovitch's six book Peter Grant series, late in the year. 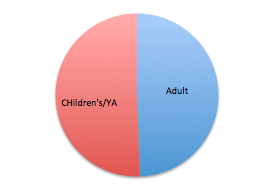 I noticed while I was doing my figures that men seem to have written most of the non-fiction I consumed this year. Hm. Something to keep an eye on, perhaps. I read four books with a mix of male and female contributors. Very close to a fifty-fifty split this year! I think I found some adult books I actually enjoyed this year for a change -- I haven't had much luck with adult books in recent times. 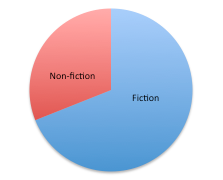 And again, fiction is a clear winner, with about three quarters of the total. This is consistent with last year. What a lovely, colourful, even spread! 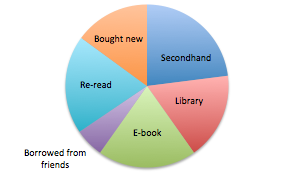 I'm surprised the proportion of secondhand books is down -- however, this doesn't account for the huge pile of books I've bought secondhand that I haven't got around to reading yet! Lots of books bought for the Kindle, too, a combination of desperation (when I couldn't find a book group title elsewhere) and impatience (hello, Ben Aaronovitch). I re-read lots of books this year too, all my Antonia Forest collection and L. M. Montgomery's Emily series. Yeah, well, so much for diversity. I'm a little ashamed to say that this was the year of the comfort read, not the challenging read, and the diversity of my authors suffered accordingly. 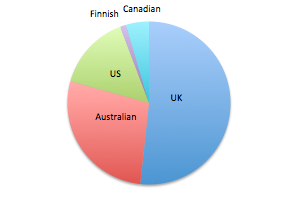 Although I think within those national categories, I did read more diversely than this chart would suggest. Maybe. 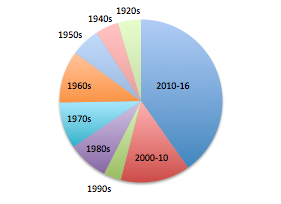 More than half the books I read this year were published in the last sixteen years, so relatively recently, with the other half being more or less evenly spread through the decades of the twentieth century. Though I notice I didn't read anything published in the 1930s! How did I manage that? Of the 87 books I read, 5 were graphic novels or predominantly pictorial. And I loved re-discovering Elizabeth Goudge, a neglected old favourite: The Dean's Watch, Linnets and Valerians and The Rosemary Tree all soothed and refreshed me this year. Wishing you all a wonderful 2017 -- and a year filled with reading! I didn't know much about the Shakers before I read this book. They were an American sect who made chairs? It turns out they were quite similar to the Quakers, but with some crucial differences: they lived in celibate, communal communities, and instead of silent worship, they celebrated God with dance and song. Not surprisingly for a celibate organisation, they've now all but died out -- I think there are four Shaker Brothers and Sisters left. But their legacy endures, in their beautifully crafted, clean-lined furniture, their art and music, and their intriguing history. They were one of the rare sects who truly believed in, and practised, equality of the sexes -- founded by a woman, and with two Brothers and two Sisters appointed to run their affairs. There's much that appeals about the Shaker way of life, and I'm not surprised that they were still attracting converts well into the twentieth century. 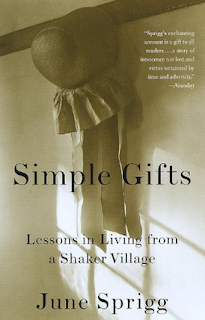 In this memoir, June Sprigg recalls the summer of 1972, when she was nineteen, working as a tour guide in one of the last Shaker villages, populated by a mere handful of old women. The young June forged a profound connection with these (mostly) wise, humorous and kind women, a connection that shaped the rest of her life (she went on to write several books about the Shakers, and worked in Shaker museums). She even contemplated staying on as a permanent member of the community, but decided that way was not for her. It's not exactly a gripping narrative, but this quiet, contemplative book was not a bad way to finish off my reading year. Since the Western Bulldogs' unexpected Premiership victory, there has been a veritable tide of memorabilia pouring out of the Whitten Oval and AFL shops: DVD box sets, signed posters, blockmounted jumpers, replica cups, stubby holders, you name it. We've been relatively restrained at our house -- two books and one box set, and a framed photo collage which was a Christmas present and therefore not our fault! I wasn't aware of this book until I unwrapped it on Christmas morning. Put together by John Harms and Mandy Johnson, it's a product of the on-line site, the Footy Almanac, which collates and publishes fan accounts of each game of the season. 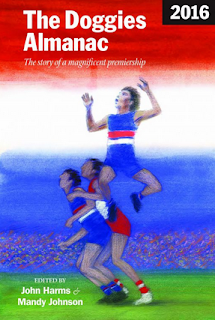 This book is a collection of pieces about the Bulldogs' year, round by round, culminating in lots of accounts of the extraordinary journey through the finals. There are lots of stories here, some funny, some poignant, from fans aged 80 and fans aged 11. It was so much fun to live through the year all over again, though there were some very dark moments -- Mitch Wallis's screams of agony, Bob Murphy's knee -- but the happy ending makes it all worth while. The Bulldogs' story this year reminded everyone what can be so good about football -- the romance, the heartbreak, the history, and the possibility of overwhelming joy, and I'm so grateful to have experienced it all. 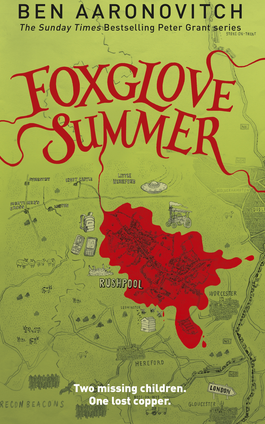 Foxglove Summer takes our hero, Peter Grant, out into the countryside of Herefordshire for a nice change of scenery, if not pace. He rapidly becomes entangled with the search for two missing girls, some mysterious bees, the fairy people and echoes of the events of the last book. I really enjoyed this foray into rural magic, feeling more at home with that than the urban kind, much as I've relished that, too. Downside: not much Molly or Thomas Nightingale in this one. But otherwise this is close to being my favourite. I love that Peter, so street smart and knowlegeable on his own turf and filled with fun facts about architecture and the history of London, can't tell one tree from another. And speaking of trees... The Hanging Tree finds us back in London, but this time it's posh London, with spoilt kids and fast cars and flash apartments, and Peter is getting closer to discovering the identity of the Faceless Man. I think Guleed, the Somali ninja, has taken over Lesley's place in my heart... All the threads of the story are starting to weave together, and we are getting some answers. I love that the magical world is expanding, too, with schools of American magic and parallel women's magic entering the plot. But the story isn't finished yet. How long till the next one, Ben? HOW LONG??? I wasn't expecting -- that. I was expecting something big and shocking to happen, because Memoranda had warned me that something big and shocking happened at the end of this book, so as I was reading, I was scanning for clues and anticipating possible scenarios. But the ending has left me gobsmacked... though it does make sense. I think. 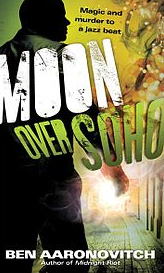 Gotta go -- book 5 is waiting on my Kindle... Do I really have to cook dinner first? Just one chapter? Please? * These titles are so clever, by the way. ** This idea appeals to me because I once used it in a book myself -- ie The Waterless Sea. I am deep in my Ben Aaronovitch binge session and I inhaled this third volume in next to no time - hey, it's the holidays now, right? So it's perfectly okay to sit in bed and read during daylight hours. Anyway I have to be quick in case I need to buy any more books before my New Year's Eve deadline! 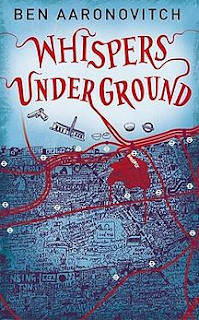 Whispers Under Ground is a creepy adventure involving the Tube, wading through sewers, magic pottery, modern art, half-goblins, an FBI agent, and Lesley becoming a fully-fledged member of the Folly (though it's never been really explained to my satisfaction how she can do magic without being properly and laboriously taught the way Peter himself is. But never mind, I'm just glad she is more involved in the story, with her proper policing instincts.) The more we learn about the Folly and Nightingale's colleagues, the sadder it is -- they were all wiped out during World War II during a dreadful operation at Ettersburg, the wizarding equivalent of the destruction of Gallifrey in the new Dr Who. I think Nightingale, marooned in his pre-war understanding of the world and codes of honour, might be my favourite character. After poor Lesley. And Peter himself is pretty good too. And then there are all the other fantastic, colourful, interesting characters. Oh, I can't decide! So... more adventures of Peter Grant, Thomas Nightingale, Molly, Dr Walid and the crew. This book is a fair bit raunchier than the first, which is important for the plot. It also centres on the jazz scene in Soho, and jazz doesn't really float my boat, but having said that, this is a satisfying follow-up. The action and the gore are exciting, but the parts of the series I really enjoy involve Peter's deepening knowledge of magic itself and the history of the practioners who have gone before (also important to the plot in this book), and, funnily enough, the mundane details of police work, the jargon and insider culture. I don't know if that stuff is all invented or if Ben Aaronovitch has an informant in the force, but it's very convincing. These books have been coming out in rapid succession. 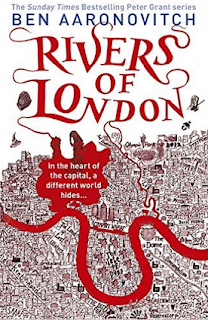 Either Aaronovitch is an impressively swift writer, or he's been planning this series for a long time. Either way, kudos to him, it's a great achievement. Oh my lord, this book is SO GOOD! It was highly recommended by both Memoranda and The Great Raven, so it could hardly fail, but trust me, it was pure delight. 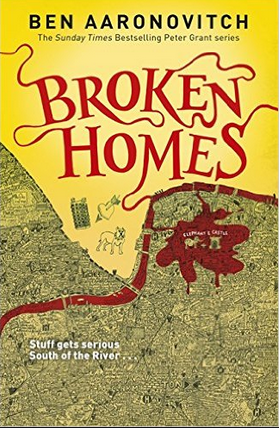 One part police/crime mystery, one part Neil Gaiman, with a good sprinkle of history and geography, a dollop of gore, a generous serving of laughs... This book has it all. The good news is that, having raced through the first book in the series at top speed, I know that several more volumes await. I actually walked to the Northcote library to grab the next two while they were still on the shelf. But after that I might be in trouble -- my New Year's resolution is to not buy any more books till I finish the ones I've already got... But I can foresee a serious Peter Grant addiction coming on, in whose grip I will be helpless. This is one of the books I picked up in Castlemaine. 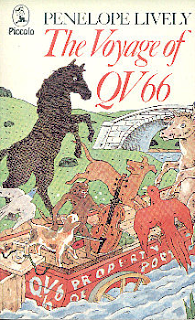 I was chuffed to add it to my collection of Penelope Lively's children's books, which are among my favourites. But I'm kicking myself that I didn't also buy A Stitch In Time, because I wasn't sure if I already had it -- does this ever happen to you? I lose track of which books I actually own and which books I just wish I owned. Anyway, I was pretty sure I had A Stitch In Time, but of course when I got home and checked, I didn't. Bugger. Then I would have had them all! In a way, this is a kind of time-slip book; it's set in a vague future England where apocalyptic floods have necessitated the mass evacuation of humans (apparently to Mars! ), leaving the Earth populated with animals and the detritus that People have left behind. And there is a weird episode at Stonehenge, which is very Penelope Lively, where some animals (crows, oh dear) seem to have slipped into a kind of barbaric pagan ritual. In fact there is a lot of oblique commentary on the foolish ways of humankind, as played out by the animals, including prejudice against those who are different, the exercise of power through violence and religious ritual, even pointless bureaucracy. Much of this would probably fly over the head of a child reader, but the animals' journey is eventful and amusing enough even without the social analysis. This would be a great read-aloud for a seven or eight year old, and would probably provoke lots of discussion -- like 101 Dalmatians did at our house. Perhaps not the best, but definitely one of the most interesting books I've read this year. I've been looking out for this for ages but I'd given up hope of ever finding it, it was so obscure -- an ethnographic study of fanfic writers from 1992 -- but miraculously, good old Brotherhood Books came through for me again! And wow, I'm so glad they did. Camille Bacon-Smith spent eight years infiltrating the Star Trek fan fic community and Enterprising Women is the result of her study. (Apparently it was quite controversial on publication, as some of her informants felt they'd been misquoted or misunderstood.) It's quite an academic text, and in parts pretty dense with theory and analysis, not necessarily an easy read. 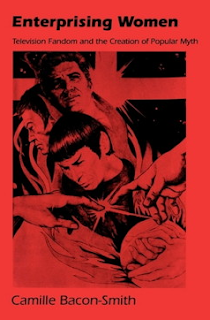 But there were so many fascinating aspects to this book, not least of which was the account of the daunting logistics of producing and distributing fan fiction and fan art before the internet came along, not to mention viewing 'source product' ie the original TV shows. Bacon-Smith spends many pages detailing the elaborate system of 'circles' and fanzines, with photocopied stories passing from hand to hand, and videotapes of videotapes copied in someone's lounge room and lent to friends -- stuff you can find now with the press of a key on YouTube, not to mention the millions of words of fanfic for every possible fandom, instantly accessible on your laptop screen. Bacon-Smith's study deals principally with the Star Trek fandom, but also covered Blake's 7 and The Professionals, which was a pleasant surprise, as they were both shows I was obsessed with in the 1980s. And here I must confess my personal interest in this subject. I too was a fanfic writer, though I never heard the term and never shared my work with a living soul. In fact most of the time my narratives played out only inside my head and were only occasionally written down. What interested me especially was the realisation that I had independently explored several common fanfic genres without knowing that they existed as a category: the Mary Sue story (featuring the idealised ingenue), the cross-universe story (mixing up Blake's 7 with Dr Who, or Dr Who with All Creatures Great and Small... ah, Tristan! ), and the hurt-comfort story (which was so easy to act out when you were lying in bed at night before you fell asleep). Clearly there are specific psychological needs which are being met by these narratives, and while Bacon-Smith has her own theories, they didn't always completely convince me. Anyway, there was lots of food for thought and memory here, and it's inspired me to think about maybe writing something about this important phase in my life, and what it meant to me. I spent last weekend in Castlemaine with seven wonderful women, celebrating the twentieth anniversary of our book group. (I've only been a member for about five years, but I was allowed to come along anyway!) We had a fabulous time, eating, drinking, wandering, chatting about life and books -- and of course we visited book shops. Alan Garner's ability to pack in such vivid poetry and elliptical wisdom into so few pages leaves me breathless with admiration. Every word packs a punch; nothing is wasted. 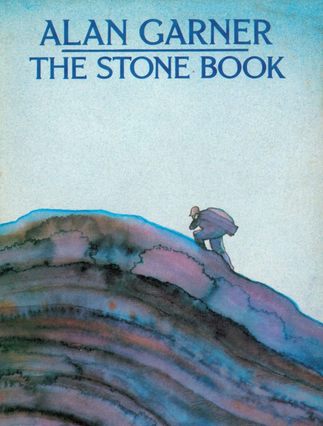 In The Stone Book, Mary longs for a book to carry in church like the other girls. But her stonemason father (echoes of William Golding's The Spire which I read a couple of months ago!) 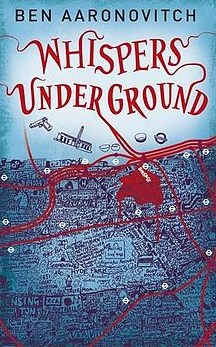 instead takes her to a hidden place underground, where she discovers a secret that moves her more profoundly than words. I feel as if I've only had part of the story. Now I need the other three quarters of the whole. Clementine Ford is a welcome, in-your-face presence in mainstream media through her Daily Life articles and her lively Facebook and Twitter activity. Now Fight Like A Girl has collected her thoughts and observations on a variety of feminist issues in one volume. She's angry, and so she should be, and so should we all: at sexual violence, inequality, the silencing of women's stories, at the routine abuse of women, like Ford herself, who dare to speak up and speak out. Ford quotes some of the obscene comments that her opinions have attracted. At first it's shocking, disgusting; you can't quite believe that there are men in the world who actually think this way and feel justified in saying it openly (albeit anonymously, behind the shield of a keyboard). But after a while, it becomes absurd and laughable. Come on, guys! Seriously? I agree with Ford that ridicule can be a powerful weapon, as effective as the Ridikulus charm against a Boggart. 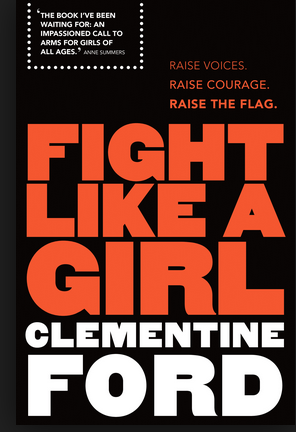 Clementine Ford is unapologetically, entertainingly ranty, and the energy of her anger and her humour is bracing. At times I found myself wanting some slightly deeper analysis, and perhaps a clearer pathway for change. This is not academic feminism as I encountered it at university, and it's all the more accessible for that. I'll be lending this book to my fifteen year old daughter; it's a good place to start, but it's only the first step on the journey.